Ever needed medical care when traveling? This is a travel App every parent, brother or sister would want their family member to have on their iPhone/iTouch while exploring the world. mPassport helps people find reliable medical care when far from home. 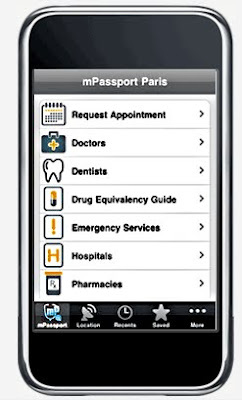 Touted as a "personal medical concierge" mPassport lets you review doctors, dentists, hospitals and pharmacies, consult a map then request an appointment. So far, this Travel Medial Assistance app is only available for London and Paris, but a roll-out of additional cities is in the works. Don't fret my pet, if you are traveling somewhere other than London or Paris, no problem. Use mPassport's mobile or non-mobile site to access to same info. The cost ranges from $9.95 for 30-days, to $49.95 for a 1-year subscription.